Bussell Island, formerly Lenoir Island, is an island located at the mouth of the Little Tennessee River, in Loudon County, near the U.S. city of Lenoir City, Tennessee. The island was inhabited by various Native American cultures for thousands of years before the arrival of early European explorers, and is currently home to Tellico Dam and a recreational area. Part of the island was added to the National Register of Historic Places for its archaeological potential in 1978. Native American habitation of Bussell Island dates to the Late Archaic period (c. 3000–1000 BC). The island is believed to have been the location of the capital of Coste—a Mississippian-period chiefdom visited by Spanish explorer Hernando de Soto in 1540—and was later part of the domain of the Overhill Cherokee. In 1887 and 1919, archaeologists conducted extensive excavations at Bussell Island and identified its archaeological importance. The island was drastically modified in the 1970s when the Tennessee Valley Authority (TVA) built Tellico Dam. Bussell Island is situated where the Little Tennessee River joins the Tennessee River, just over 601 miles (967 km) upstream from the mouth of the latter. The island originally stretched for about a mile up the Little Tennessee, but the construction of Tellico Dam across the island's west river channel in the 1970s created a reservoir that flooded the southern two-thirds of the island. To contain the reservoir, an earthen levee was built along the island's new south shore and across the island's east river channel, connecting the island to the mainland. TVA's construction of a canal connecting the Tellico and Fort Loudoun reservoirs severed this section of the mainland, thus creating a new island that stretches for about a mile east-to-west, and touches three TVA lakes—Fort Loudoun, Watts Bar, and Tellico. Lenoir City is located along the Tennessee River opposite Bussell Island. U.S. Route 321 (Lamar Alexander Parkway) crosses the island's new eastern half, and State Route 444 (Tellico Parkway) traverses the center of the island, with the two roads intersecting on the island's eastern tip. US-321 crosses via the J. Carmichael Bridge, which spans both Fort Loudoun Dam and the canal. John W. Emmert, who conducted excavations on the island in 1887, stated that the original island covered 200 acres (81 ha), and rose to a maximum of 15 feet (4.6 m) above the river. Emmert described the island's banks as "steep" with "heavy timber and much cane growing along them." Emmert also noted that the island was occasionally submerged when the Little Tennessee flooded, and noted that his excavation work was interrupted by one such flood which submerged the island to upwards of 12 feet (3.7 m). The earliest known inhabitants of Bussell Island lived during the Late Archaic period (c. 3000–1000 BC), and occupied the island sporadically throughout the Woodland period (1000 BC – 1000 AD). Archaeologist Mark R. Harrington, who conducted extensive excavations in the area in 1919, called these early inhabitants "Round Grave" people, due to their practice of burying their dead in small, round graves. 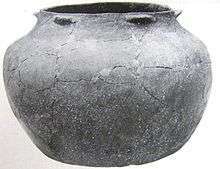 The Round Grave people used tools made of animal bone and stone, and used both steatite vessels and simple pottery. The successors to the Round Grave people at Bussell Island were a people Harrington simply called the "Second Culture." 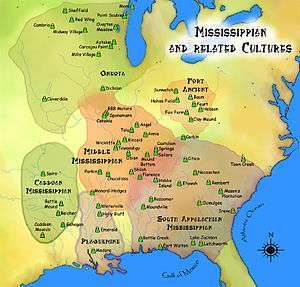 This culture was part of what is now known as the Mississippian culture, which flourished in the upper Tennessee Valley between 900 and 1600 AD. The Mississippian people of the upper Tennessee Valley are known for their large platform mounds and conical burial mounds, including several found on Bussell Island and the surrounding mainland. Bussell Island's Mississippian inhabitants used triangular flint arrowheads, celt axes, and wore ornaments made from copper and seashells (the latter suggesting trade with coastal regions). In 1540, Spanish explorer Hernando de Soto embarked on an expedition across what is now the Southeastern United States, then called "La Florida," in hopes of finding a route to Mexico. Marching north from Florida, De Soto passed through modern South Carolina and North Carolina before turning west and crossing the Blue Ridge Mountains via the Nolichucky Valley into East Tennessee. After resting for several weeks at the prominent village of Chiaha (near modern Douglas Dam), De Soto continued down the French Broad River and Tennessee River to the village of Coste, centered around Bussell Island, arriving at its outskirts on July 1, 1540. De Soto held a friendly meeting with the chief of Coste on July 2, but relations quickly soured after the Spaniards pillaged some of the Costeans' storehouses, and several Costeans attacked the Spaniards with clubs. De Soto then devised a ruse in which he kidnapped the chief and held him hostage for several days. After the chief promised to assign guides and porters to the expedition, De Soto departed on July 9. The expedition continued up the Little Tennessee to the village of Tali (near modern Vonore), and eventually found its way south to Coosa, in northern Georgia. The inhabitants of Coste, like the inhabitants of Chiaha, spoke a Muskogean language similar to that used by the later Creek and Koasati tribes (linguist Charles Hudson suggests that the term "Koasati" may have been derived from "Coste"). Coste was probably part of the Coosa chiefdom's sphere of influence, which stretched from the upper Tennessee valley south into central Alabama. In 1567, another Spanish explorer, Juan Pardo, visited the villages of Chalahume and Satapo further up the Little Tennessee Valley, but turned back before reaching Coste. In the mid-18th century, more than a dozen Cherokee villages—known as the Overhill towns—were scattered along the lower 55 miles (89 km) of the Little Tennessee River, among them the villages of Chota and Tanasi. The village of Mialoquo, the lowermost of the Overhill towns, was located about 17 miles (27 km) upstream from Bussell Island. Harrington's excavations on Bussell Island uncovered numerous Cherokee graves—identified by the graves' "rectangular" shape and the presence of European trade goods such as glass beads—although no known major Cherokee villages were located on the island. Henry Timberlake, who traveled up the Little Tennessee in 1761 on a peace mission, met a Cherokee head man named Slave Catcher near the mouth of the Little Tennessee, but makes no mention of the island. Throughout most of the 19th century, Bussell Island was known as "Lenoir Island," after William Ballard Lenoir, who established a large plantation and cotton mill at what is now Lenoir City. In 1887, John W. Emmert conducted the first major excavations at Bussell Island for the U.S. Bureau of Ethnology. By the time Harrington excavated the island in 1919, the island had come into the possession of the Bussell family, who operated a ferry along the opposite river shore in Lenoir City. The Tennessee Valley Authority, charged with building a series of dams to generate hydroelectricity and control flooding in the 1930s, initially wanted to build Fort Loudoun Dam downstream from the mouth of the Little Tennessee, thus creating a reservoir that would expand across both the upper Tennessee River and lower Little Tennessee River, but engineers were unable to locate a suitable downstream site for a dam. They instead built the dam about a mile upstream, and made plans to build a dam at the mouth of the Little Tennessee—known as the Fort Loudoun Extension—which would divert water to the Fort Loudoun reservoir and increase that dam's generating capacity. Due to lack of funding, however, the Fort Loudoun Extension project was shelved until the 1960s. TVA revived interest in the Fort Loudoun Extension—renamed the Tellico Dam project—in 1964, although they met immediate opposition from a group of citizen activists that included environmentalists, historical conservationists, and Native Americans. Construction of the dam began in 1969, but litigation stalled its completion until 1979, allowing the University of Tennessee to conduct extensive excavations at sites throughout the Tellico Basin. As a result of these excavations, several sites were added to the National Register of Historic Places for their archaeological potential, among them Bussell Island, designated 40LD17. Emmert's excavations for the American Bureau of Ethnology took place in 1887, and were discussed in the bureau's 12th Annual Report, published in 1894. Emmert focused on two mounds on the north end of the island, known simply as Mound 1 and Mound 2. Mound 1 was 100 feet (30 m) in diameter and 6.5 feet (2.0 m) high, and described as "thoroughly worked over." Emmert uncovered 14 skeletons in Mound 1, along with pottery fragments, flint chips, glass beads, and an iron bracelet. Mound 2 was slightly larger than Mound 1, but was flanked by a diamond-shaped terrace 570 feet (170 m) long and 8 feet (2.4 m) high which Emmert believed to be man-made. Excavators uncovered 67 skeletons in Mound 2, as well as a burnt-clay tumulus surrounded by irregular cedar-post formations. In 1919, Tennessee state archaeologist Mark Harrington boated down the Tennessee River to investigate a series of mound structures scattered along the river between Lenoir City and Hiwassee Island (about 100 miles downstream from Bussell). Like Emmert, Harrington focused on the north end of the island, although he noted that the mounds Emmert excavated had been leveled. Of the 41 burials uncovered by Harrington, 9 were of the older "Round Grave" culture, whereas the remainder were attributed to the later Cherokee inhabitants. Harrington suggested that the large diamond-shaped terrace mentioned by Emmert was actually a massive midden deposit that had accumulated over several centuries. 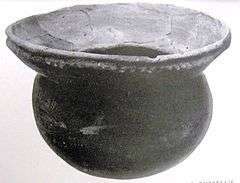 Harrington described the graves of the Round Grave culture as measuring 2 to 3 feet in diameter, with the bodies folded and compacted to fit in the graves. Typical burial goods included bone awls, steatite bowls, and animal teeth. The Cherokee graves were rectangular, with the bodies laid in a flexed position. Typical Cherokee burial items included earthenware vessels, glass beads, and pipes. Wikimedia Commons has media related to Bussell Island. 1 2 "National Register Information System". National Register of Historic Places. National Park Service. 2009-10-01. 1 2 3 Bobby Braly and Shannon Koerner, A History of Archaeology in Tennessee. Tennessee Archaeology: A Synthesis (Chapter 2). p. 12-14. ↑ Dye, David (2002). "Soto Expedition". Tennessee Encyclopedia of History and Culture. Retrieved 2011-06-29. 1 2 U.S. Bureau of Ethnology, Twelfth Annual Report of the Bureau of Ethnology to the Secretary of the Smithsonian Institution 1890–'91 (Washington D.C.: Government Printing Office, 1894), pp. 397–403. 1 2 3 4 M.R. Harrington, Cherokee and Earlier Remains on Upper Tennessee River (New York: Museum of the American Indian, Heye Foundation, 1922), pp. 50, 61–82, 277–279. 1 2 Charles Hudson, Knights of Spain, Warriors of the Sun (Athens, Georgia: University of Georgia Press, 1997), 204–207. ↑ Charles Hudson, The Juan Pardo Expeditions: Explorations of the Carolinas and Tennessee, 1566–1568 (Tuscaloosa, Ala.: University of Alabama Press, 2005), p. 104. ↑ Hudson, The Juan Pardo Expeditions, p. 10. ↑ Hudson, The Juan Pardo Expeditions, pp. 36–45. ↑ Schroedl, Gerald (2002). "Overhill Cherokees". Tennessee Encyclopedia of History and Culture. Retrieved 2011-06-29. ↑ Russ, Kurt; Chapman, Jefferson (1983). Archaeological Investigations at the Eighteenth Century Overhill Cherokee Town of Mialoquo (40MR3) (Technical report). University of Tennessee Department of Anthropology, Report of Investigations. 37. ↑ Henry Timberlake, Samuel Williams (ed. ), Memoirs, 1756–1765 (Marietta, Georgia: Continental Book Co., 1948), p. 56. 1 2 Kenneth Murchison, The Snail Darter Case: TVA Versus the Endangered Species Act (Lawrence, Kan.: University Press of Kansas, 2007), p. 15. ↑ Jefferson Chapman, Tellico Archaeology: 12,000 Years of Native American History (Knoxville, Tenn.: Tennessee Valley Authority, 1985).